So what is the difference between a pupil and a student? There are many differences but the main ones have to be, firstly, students do not need discipline as pupils do and, secondly, students are more focused than pupils. These things make life easier for the college teacher / lecturer. However, there is no interaction with individual students, which has to be one of the most satisfying aspects of teaching at primary and secondary level. Even tutorials have a certain distance and formality between tutor and student. Yet, ironically, it is at the very highest level of education, studying for a PhD, that the lecturer gets to interact with and get to know the candidate. 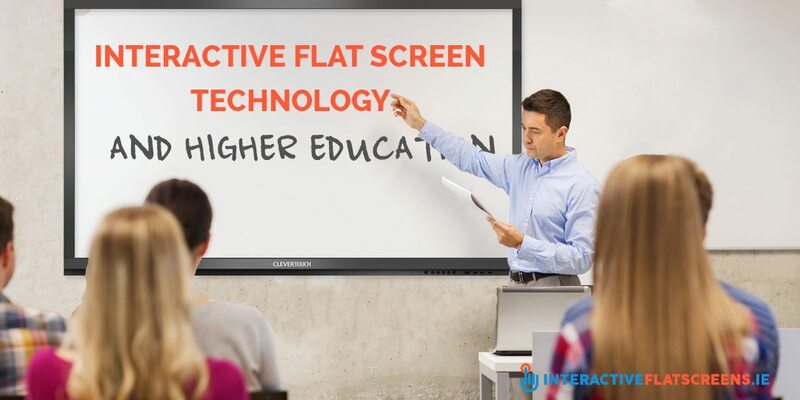 Interactive flat screen technology is as suited to higher education as it is primary and secondary education. There is no direct interaction with the screen as students don’t need to learn this way because of their level of intelligence and maturity. However, there is one exception: the presentation. Anyone who has studied at third level and completed a degree will tell you that you will have to give a presentation at least once, be it at a tutorial or in a lecture theatre. The interactive flat screen is perfect for presentations. For many students it is their first experience of public speaking, so it can be nerve wracking. The interactive flat screen will help things to go smoothly as it is so easy to operate. Its beauty lies in its simplicity. Giving a presentation involves alternating between speaking and showing. Only you can take care of the speaking part but the interactive flat screen is ideal for showing. The Clevertouch screen is probably the best on the market. The associated Clevernote app will allow you to summon and manipulate images with the touch of a finger. It is the showing aspect that makes a presentation different from merely reading an essay out loud. 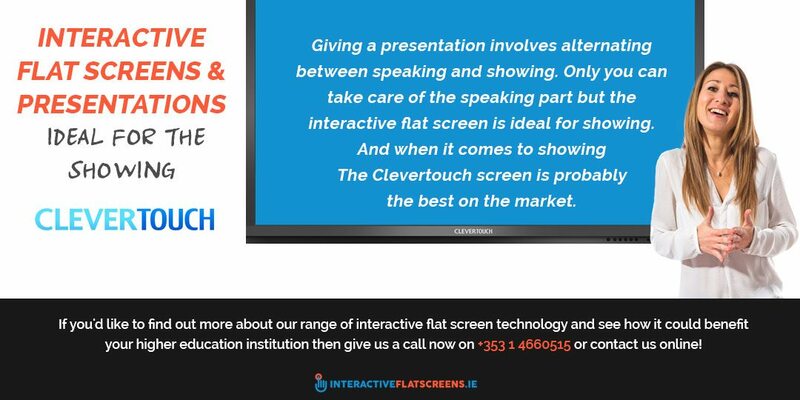 Showing has never been so easy with the Clevertouch interactive touch screen and the Clevernote app. A presentation is preparation for both the academic world and the business world so it’s important that you get it right. If you want to stand out and get noticed by a lecturer, a good presentation will do it and the interactive flat screen will do much of the work for you. A presentation is also the first time a student will experience the power of interactive teaching technology. Using it is like an elegant dance between finger and screen. Once you get into the swing of it you will wield this power confidently and become a dancer! A presentation by a student is a brief role reversal as the teacher / lecturer becomes the recipient and the student becomes the imparter of knowledge. This is only the nature of things: the student becomes the master. The interactive flat screen will help you not only to get through but to enjoy the experience and leave you wanting more. 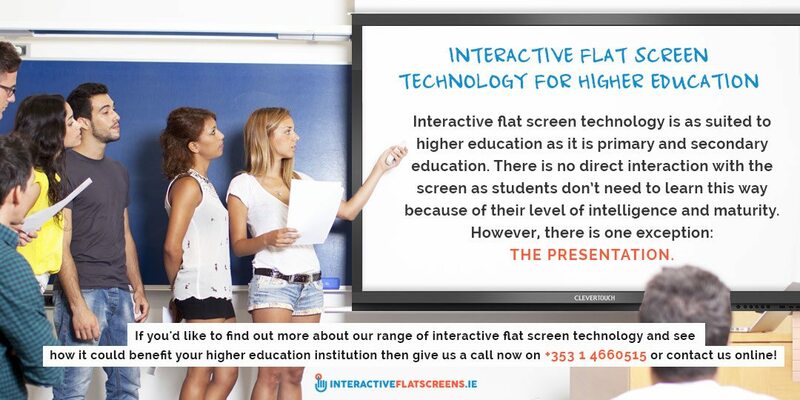 If you’d like to find out more about our range of interactive flat screen technology and see how it could benefit your higher education institution then give us a call now on +353 1 466 0515 or contact us online!